Growing evidence links children’s physical and psychological health with their future economic opportunities and potential. Until recently, the economic strengthening community has presumed that greater household economic welfare also leads to improved wellbeing for children. While some evaluations do support this assumption, conclusive evidence across a range of interventions is lacking, with some studies even showing negative impacts on children. 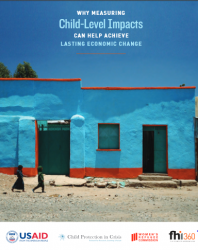 In order to maximize the long-term impacts of economic strengthening activities while staying true to the principle of doing no harm, this report proposes that economic strengthening programs seeking to improve the wellbeing of vulnerable households assess and monitor child-level outcomes and impacts, even when children or youth are not direct program participants. This technical guide presents an argument for the systematic monitoring and evaluation of child wellbeing related to economic strengthening efforts. Economic strengthening aims both to address the short-term needs of poor people and to enable entire communities to overcome poverty and live healthy, productive lives.